It is hot. I mean, it is a warmer for us in the Northwest. Sheesh! I worked out in the basement in slow motion, due to fear of overheating. Overheating or overeating? Seriously, these last few days have been brutal. Chocolate has never seemed to taste so good in the 34 years of my existence. Eight weeks ago, I was rear-ended in my friend’s car. I have been very diligent in eating as one should who has been rear-ended and can’t partake in daily activities, but I am concerned something was knocked in my brain. My taste-bud sensies have been magnified. My husband made mention the other day I had not posted a post in some time. This baffled me, because I was certain it had been a couple of weeks ago. So much has been going on. I found two gray hairs in 2’s hair which through me off to the max. I took him to my natural path and discovered he has allergies to wheat, gluten, and dairy. More and more I am meeting those with the same allergies, my sister included. So the whirlwind of transforming my meals has been a bit intense. So sad about not baking with spelt or kamut, but learning the ropes with brown rice and coconut flours. It has been 2 weeks and we have noticed such a difference in 2’s countenance and alertness. It used to be when he would wake up in the morning he would sit on the couch with his blankee and tell us in a low voice, “I’m hungry.” He would just sit there quiet. Now he is up and at ’em. Preparing his own breakfast, running around the house dressed as batman, spiderman, or superman. He is climbing, jumping, and kung foo-ing. He is being a boy, I guess, but seriously, we had no idea this was in him. He had always been the quiet, not so active, super chill little kid with a soft little voice. Needless to say it has been pretty cool to see the transformation. In times past, I used to make one meal for me and one dish for the family, but now it is pretty much revolving around 2’s needs, which is crummy for Sean, but such a breeze for me. One meal deals and two big choices…to eat or not to eat? That is the question. This is a meal I have been craving. I made it with the tahini sauce recommended and served it with cucumber and fresh spinach leaves. It was delish. Pour the chickpeas into a large bowl and cover them by about 3 inches of cold water. Let them soak overnight. They will double in size as they soak – you will have between 4 and 5 cups of beans after soaking.Pulse all ingredients together until a rough, coarse meal forms. Scrape the sides of the processor periodically and push the mixture down the sides. Process till the mixture is somewhere between the texture of couscous and a paste. You want the mixture to hold together, and a more paste-like consistency will help with that… but don’t overprocess, you don’t want it turning into hummus!Cover the bowl with plastic wrap and refrigerate for 1-2 hours. Fill a skillet with vegetable oil to a depth of 1 ½ inches. I prefer to use cooking oil with a high smoke point, like grapeseed. Heat the oil slowly over medium heat. Meanwhile, form falafel mixture into round balls or slider-shaped patties using wet hands or a falafel scoop. I used about 2 tbsp of mixture per falafel. You can make them smaller or larger depending on your personal preference. The balls will stick together loosely at first, but will bind nicely once they begin to fry. Note: if the balls won’t hold together, place the mixture back in the processor again and continue processing to make it more paste-like. Keep in mind that the balls will be delicate at first; if you can get them into the hot oil, they will bind together and stick. If they still won’t hold together, you can try adding 2-3 tbsp of flour to the mixture. If they still won’t hold, add 1-2 eggs to the mix. This should fix any issues you are having. When the oil is at the right temperature, it will take 2-3 minutes per side to brown (5-6 minutes total). If it browns faster than that, your oil is too hot and your falafels will not be fully cooked in the center. Cool the oil down slightly and try again. When the oil is at the right temperature, fry the falafels in batches of 5-6 at a time till golden brown on both sides.Let them drain on paper towels. Serve the falafels fresh and hot; they go best with a plate of hummus and topped with creamy tahini sauce. You can also stuff them into a pita. Grind tahini paste, water, lemon juice and garlic together in a food processor or blender till sauce is creamy and ivory-colored. Pause blending and use a long-handled spoon to break up the thick part of the sauce once every 30 seconds; this will keep it from clogging your processor or blender blades. After a few minutes of blending, sauce will turn into a rich, smooth paste. If mixture is too thick, slowly add more water until it reaches the preferred consistency. If using tahini to top hummus or a meat dish, keep it thick and creamy. 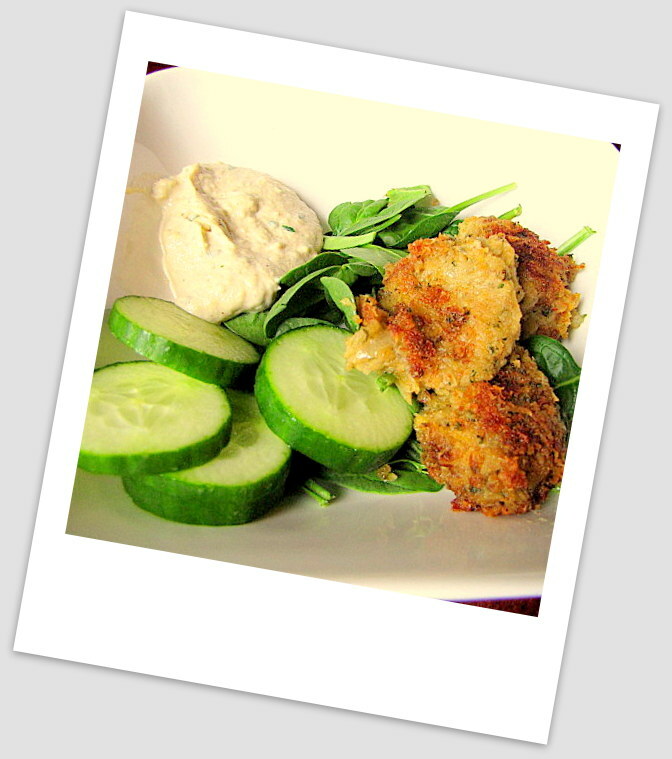 As a condiment for pita or falafel, a more liquid sauce is usually preferred. Taste often during the blending process; add more lemon juice or salt, if desired. When you’re happy with the sauce’s flavor and consistency, pour it into a bowl. Stir in parsley (optional) till well combined, or garnish sauce with fresh parsley on top. 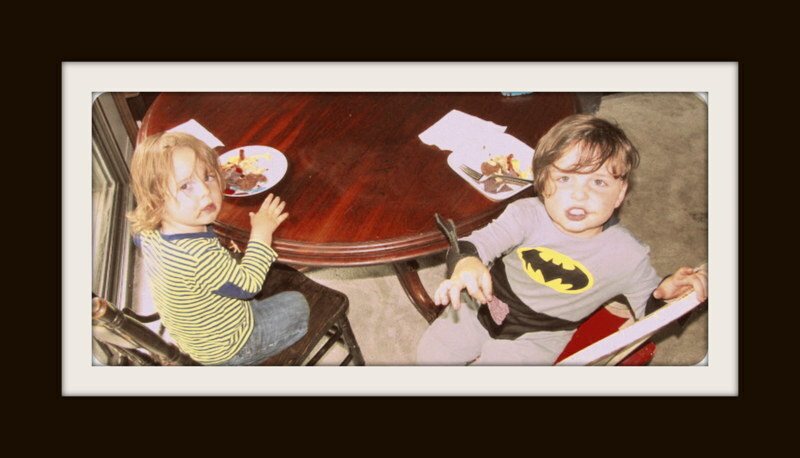 A picture of batman and robin with their new special power foods.